The 29th Annual Candlelight Walk will be presented over two nights. 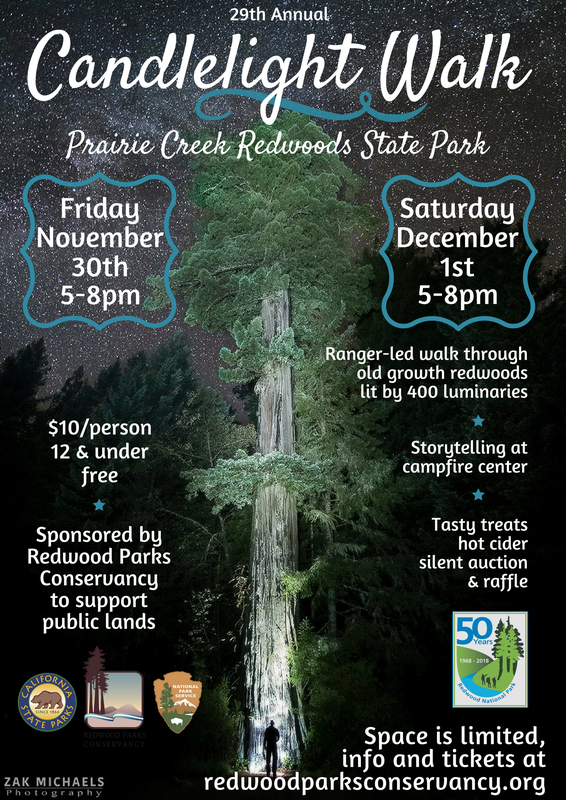 Held at Prairie Creek Redwoods State Park visitor center. Doors open at 5:00 pm. Join us for auctions and light refreshments in the Prairie Creek Visitor Center before the Walk starts at 6:00 pm. Please do not bring traditional fire powered candles as the trail will be lit by luminaries heading out to the campfire center for storytelling. Note: the walk is less than a 1/2 mile round trip on a level path. Sorry, no dogs. Please dress accordingly as the event will happen rain or shine. Thank you! This is a very popular event and tickets are limited.